Hemmed in? No Done In. 1 More Time? Or Time and Time Again? Really! The hem is being done, and soon (today) the wire will be added and version 2.1 is done and documented. It's version 2.1 because the lace in the brim is slightly different—can you see? The little rain drop between the petals(rays) are smaller, and the rays(petals) are slightly different too. Are they petals? ( Is this a flower hat?) Or are they flaming rays of the sun (a sun hat? )I haven't decided! Well, version 2 (the multi-colored yarn) is the documented version. But as Michele (aka PDX) said in her comment, (2 days ago) a pattern is not carved in stone—it's OK to change the pattern to make the petals/rays smaller (or larger) or lacier, or to add more rows to the brim to make it deeper, (or to knock a row or two off, to make it shallower) A pattern is supposed to give you a set of directions that works—and then once you've done it once, Do it again and tweak the design to make it just the way you want. Pam MacKenzie is doing me the great favor of knitting up a test pattern--I just completed the documentation today—but I gave her a start (the crown) a few days ago--So.. if things are 100% OK --The pattern will done it will be a week or so. Goodness knows, I've tweeked it. In version 1 (peachy lace hat), I sewed the hem down (BIG MISTAKE—it took too long, and was too tedious) and in version 2, I picked up stitches to make the tuck (again too much work). Version 2.1 has easy way to make the tuck, and an easy way to make the hem! 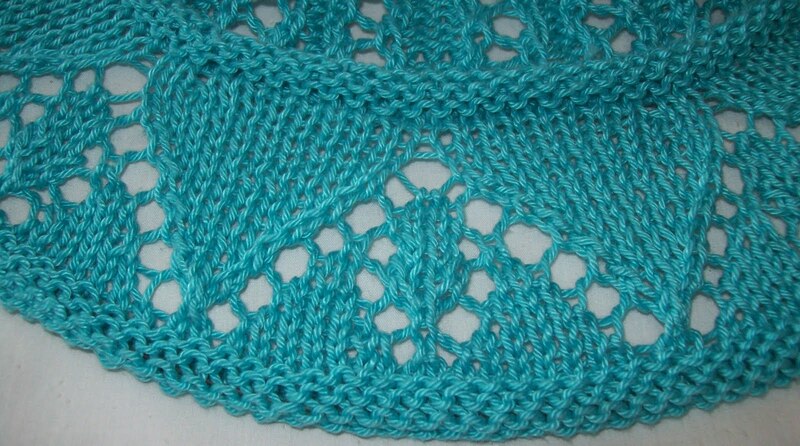 The only challenging bit is the eyelet cast on--but that's not too hard, really! This isn't going to be a be a beginners lace hat--but its not a very hard one either (I even added reminders of when and where to put in life lines--and there is one not too obvious place where small corrections can be made (and be hidden from sight). And best of all, its knit an wear--no blocking required, no stiffener required. Gorgeous! Can't wait to see the entire hat. I hope you'll have a photo of it on an actual head. For me, it makes things so much clearer.